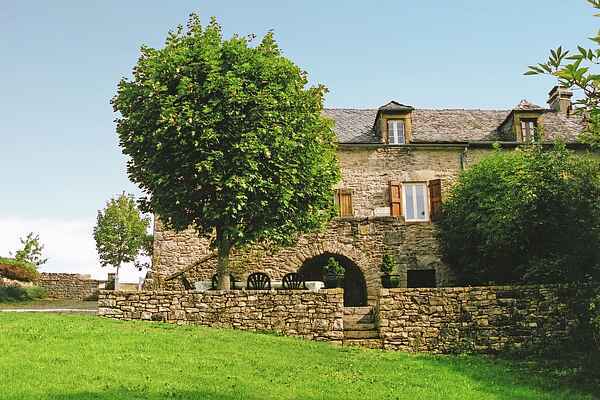 Gorgeous, semi-detached holiday home from the 18th century that used to be part of a farm. It is a beautiful, authentic, natural stone building that includes many original details inside as well. It has a lovely multi-level lawn and a panoramic view of the sloping landscape. You will find a small beach on the shores of the Lot river within a mere 7km of your holiday home, where you can swim or rent a canoe. Hiking and bicycling can be done practically anywhere in the area. There are two official trails which have been set out by Pierrefiche. You can rent bikes in the atmospheric medieval town of Geniez-d'Olt (5 km) and you will also find a bank, a supermarket, restaurants and even a disco there, as well as an open-air swimming pool and an amusement park. Bakery and tennis court within walking distance (300m). You will find the area of the Causse de Sévérac, a limestone plateau with the medieval city of Sévérac-le-Château (22 km), in a southeastern direction. A little ways further east you will arrive at the famous Gorges du Tarn (ca. 40 km). We recommend the Lac de Pont-de-Salars (22 km) and the Lac de Pareloup (40 km) if you are looking for a recreational lake with more swimming and water-sports facilities.